Home Technology iPhone 5 got a new Design Leaked! iPhone 5 got a new Design Leaked! According to an Apple engineers, the upcoming iPhone 5 would be fairly different from the iPhone 4 and weeks away from announcement. Some accessory makers posted upcoming cases for the highly anticipated handset. 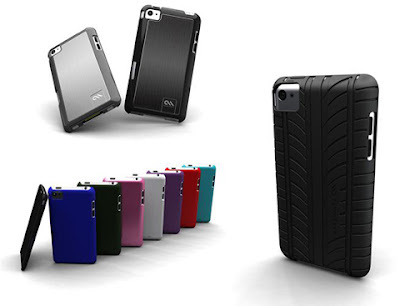 Case-Mate has published a page on its website with six different case designs for the new iPhone 5. Tons of speculation indicated that the iPhone 5 will be thinner and lighter than the current model and these cases suggest it will have tapered edges and a slim profile as well. Finally, the images appear to an aluminum back on the fifth-generation iPhone, which also jibes with earlier reports. The iPhone 5 is expected to be available in the United States in October, so we’re not surprised to see leaks like this start to spill out across the web. The long rumored 8 megapixel camera in iPhone 5 would soon turn up into reality. Some new hiring in recent times shows that Apple could come up with Near Field Communication (NFC). But this feature may not arrive this year. Through the leaked cases, one can confirm that the iPhone 5 will have tapered edges at the back, similar to iPad 2. Also, some earlier rumors suggested an elongated button and a larger display.